Cape Dodman to port. – Dirty wet dog , boats and sailing. I really enjoyed my time in Falmouth but by mid May i realised that i either had to leave and get around the Lizard to Newlyn so that the boat would be ready for a voyage out to the Scilly’s or that i would need to get the boat ashore and do the next round of work. I had an 8 day slot to play with and the possibility of a decent weather window for going west but the combination of me being very tired from work and a real need to at least scrub the hull had me messing around for a couple of days in the Fal and the Tresellian rivers such that when i was ready to go the wind was solidly back west of south so the logical thing to do was a quick sprint back to Plymouth. I dried out again in the Fal but this time put the boat deliberately onto a section of hard sand, did the scrub and had a go at sorting the rudder out : the rudder blade is loose in its cheeks and is making the steering a bit sloppy. Really i need to get the boat out in slings and redo the bottom, change the centreboard line, sort the rudder out properly etc etc and the best option for all of that is back at base. My decision to go was quite rapid : one moment beating down Falmouth roads , the next heading out past St Anthony head and having rockin/rollin slide downwind to pass the Dodman in an increasing wind and sea state. I reckon the average was about F5 and gusting 6 so it was pretty dynamic sailing. Around the Dodman i dived into Gorran Haven for a quick break : nice and sheltered close inshore but the sky had a hard and mean look with a grey band on the horizon so i didn’t hang around there long. I left in bright sunshine but ominous fast moving high cloud and with the first reef pulled down, the first half-hour was fine but after that it clagged in hard and the wind and rain really came in. By the time i got up to Fowey it was blowing decently hard and enough that i couldn’t safely film or photograph , instead i was sailing like a Whitbread pro ! getting the occasional surf : really i should have reduced sail again but i reckoned that speed equals control and the boat will surf in those conditions. As i passed cannis rock the Fowey offshore lifeboat came barreling out with pedal to metal. By the time i got an anchor down in wisemans reach it was blowing hard and raining solidly. By the next morning it was all completely quiet so took an early start, went alongside another friendly cruising boat at the town pontoon to take on some water and then left the harbour : outside it was real sloppy inshore with not much wind so rather than schlep along the coast enjoying the scenery i made some offing and in the increasing breeze made all speed back towards Rame. I hove to well offshore of Looe island for a coffee break and then set things up so that i could film as i came up on the headland. That turned into a very dynamic sailing day with an increasing wind as i got towards Plymouth, i had planned to anchor off Cawsand for a break but the SSW wind and waves make the anchorage uncomfortable so i headed straight for the bridge and the narrows with a second plan of anchoring at sandacre before heading up the Tamar. Frustratingly my engine decided to pack up completely just when i really needed it off Saltash so the best thing to do was shoot the Tamar bridges, anchor and try and sort the little troll-beast out. 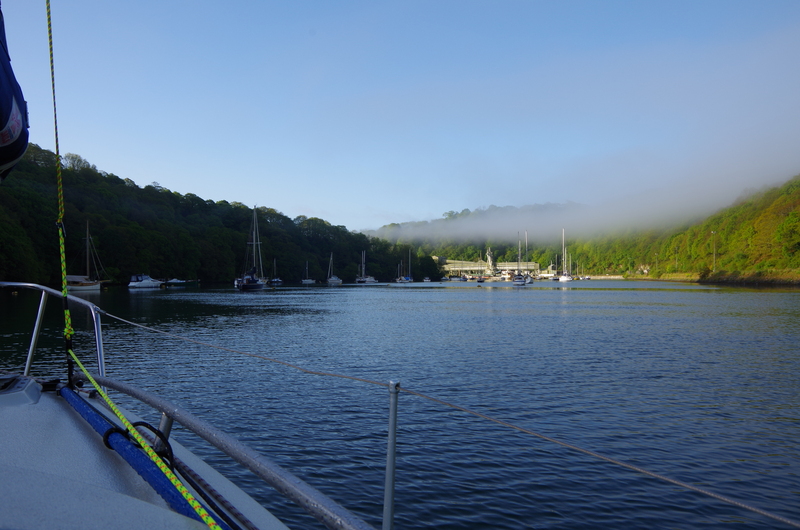 I couldn’t get it going so decided to sail back up the Tamar to Calstock…..which is the subject of my next video blog. Previous Honey i’m home !